"The Lake Track." Busy track in summer with swimming and fishing along the lake-side. Panekiri Bluff overlooking Lake Waikaremoana • By nomad. Great Walks booking season is year-round. Huts and campsites must be booked in advance. 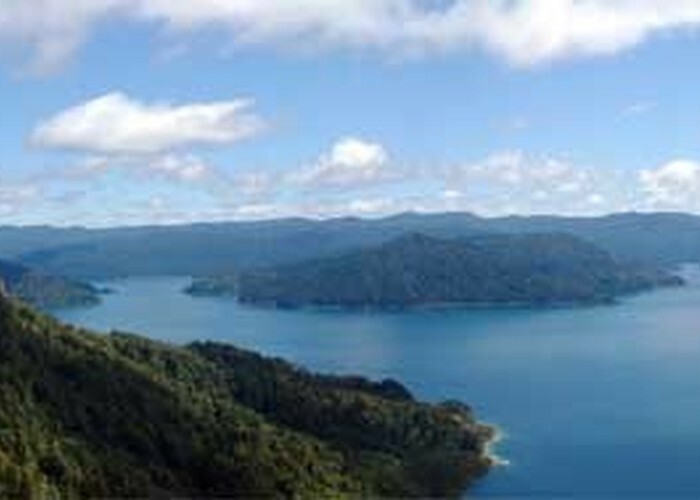 The broken, isolated landscape of Urewera National Park is a product of recent earthquakes and ongoing mountain-building. Indeed, the lake itself is merely 2000 years old, having formed behind a massive landslip. In 1946 the lake level was lowered 5m as part of a local power scheme, so the lake is edged with regenerating forest. The track leads around the western lake edge, climbing onto the crest of the Panekiri Range before dropping to the jagged shoreline. Although it is open throughout the year, the highest points on the track may be subject to snowfall. Bending in a long horseshoe curve about the lake, the track meets SH38, the road from Rotorua to Wairoa, both north and south of the lake at Onepoto and Hopuruahine Landing. On the road between the two track ends, Aniwaniwa is home to the DOC Visitor Centre, a shop, campground, and motels. Boat and shuttle bus services operate seasonally between the track ends, and public buses operate along the highway. From the car park, the track crosses the parade ground of a nineteenth century redoubt used by European soldiers to suppress the local Maori. Beyond this inauspicious spot the track climbs past a series of progressively higher trigs on the ridge. Puketapu Trig is the track's highest point, near Panekiri Hut. Panekiri Hut • Great Walks Hut (DOC). Capacity: 36.Bookings required. The track keeps to the ridge a while longer before dropping quickly to the lakeside hut. Waiopaoa Hut • Great Walks Hut (DOC). Capacity: 30.Bookings required. Before a swingbridge across Korokoro Stream a side track leads 1-1½ hr return to the 20m Korokoro Falls. Beyond the swingbridge is a campsite. Marauiti Hut • Great Walks Hut (DOC). Capacity: 26.Bookings required. Over some private land the track meets the next campsite, with the hut soon after. 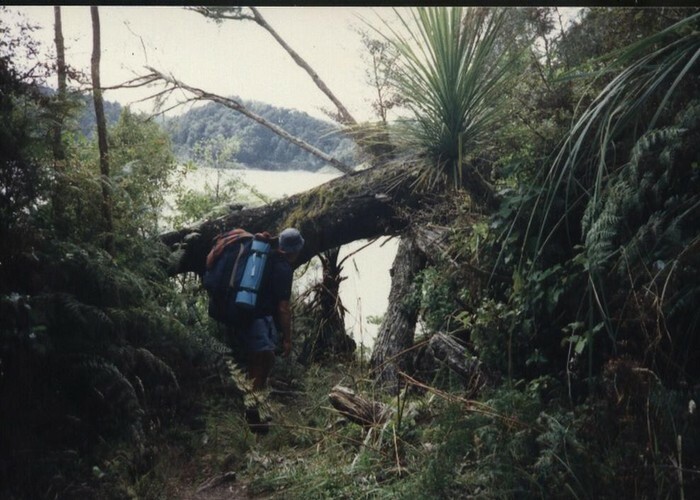 The track crosses an inland section of private land before coming to another lakeside campsite, then passing the site of (removed) Te Puna Hut. Whanganui Hut • Great Walks Hut (DOC). Capacity: 18.Bookings required. Crossing a peninsula, the track drops to the lake edge and another campsite. A section of lakeside scrub leads to the hut. A short walk leads to the track end. Added 1 June 2001 by MatthewMatthew. 4 revisions, most recently 13 July 2017 by MatthewMatthew. 652 views in the past year (54 per month).